Together, AmCham EU (The American Chamber of Commerce to the European Union) and JA Europe (Junior Achievement Europe) are putting youth entrepreneurship in the spotlight by showcasing young people who have chosen to become entrepreneurs and sending a positive message to the media and policymakers. Each year, thousands of JA alumni enter Europe’s economy as potential entrepreneurs. Since 2013 the AmCham EU Youth Entrepreneurship Award leverages JA’s network to identify young people who have participated in a JA programme, made it past the initial start-up phase and have a business concept with strong growth potential. Start-ups with at least one of the co-founders being a JA alumni can apply for the award. Nominees are selected by a jury from JA Europe and AmCham EU, with the winner being invited to the AmCham EU event hosted in Brussels. The event's guest-list usually includes MEPs, policy stakeholders, and AmCham EU members. The winning start-up is being awarded a cash prize of 10,000€ and receive mentoring from members of AmCham EU's Executive Council. In order to make the most of the moment, the selected young entrepreneurs are also given the opportunity to share their business and future plans with the audience. Bioo, a Spanish start-up, won the sixth AmCham EU Youth Entrepreneurship Award. Bioo created a unique tool to generate electricity from plants in a sustainable way. With this technology, the start-up develops a range of applications, such as phone chargers or WiFi connection terminals.. 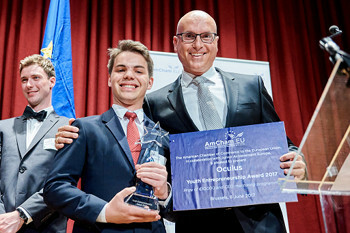 The fifth edition of the Youth Entrepreneurship Award was won by Oculus. This Romanian start-up developed the Mitra Glasses, a device that provides essential aid and safety to visually impaired people during movement, using incorporated sensors and efficient algorithms. The 2016 edition of the Youth Entrepreneurship Award was won by MeetingPackage.com (Joonas Ahola & Saku Loukonen, Finland), an online platform dedicated to the booking of meeting rooms which allows users to easily compare various meeting venues and prices. Jurors praised its potential to scale, its sustainability and the team’s marketing plan. The 2015 edition of the Youth Entrepreneurship Award was won by COOL4SEA (Christian Jensen, Denmark), an engineering firm working to develop thermodynamic, energy and environmental technologies for the international maritime industry. The jury commented on its commercial potential and praised its environmental considerations. PYNK SYSTEMS (David Mata Valdes, Spain), a start-up constructing ergonomic and smart office desks in the hope of boosting work productivity, was awarded the 2014 edition of the Youth Entrepreneurship Award. Jurors felt the focus on combining modern technology to aid manufacturing and engineering was highly innovative, as well as citing a well-coordinated business model in their decision.